Woodlawn Nature Center recognized the need for a play and learning space in the community. Volunteers stepped up to lead and carry out the project, often recruiting their families and community groups, like the Pay It Forward 4-H Club and local Cub Scout groups for help with some projects. Children were involved in creating some of the areas in Nature’s Connection. 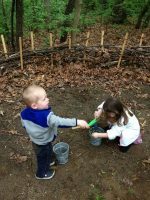 Woodlawn Nature Center uses Nature’s Connection for Nature Play sessions, a monthly Family Nature Club, weekly nature preschool programs, school field trips, and special events at the Center. Additionally, the site is open from dawn to dusk for use by the nearby housing area and local community. Information is shared through the newsletter, website, and social media accounts about the importance of nature play and nature education. • Building Area—a large, low-lying table for blocks, trees cookies, and other natural items that vary throughout the year. • Messy Materials Area—stumps, logs, and smaller tree blocks on a mulch base. The children love digging for worms and roly polies in this area, as well as creating ramps and structures. • Nature Art area—a large clear easel is used for painting, with a table with short stumps for stools used for making nature collages, mandalas, and other nature art. A low mirror is nearby to show reflections of the garden. • Dirt Digging Area—separated by a “bird’s nest” made of branches with cleared space for digging in the dirt. • Open Play Area—space for games and large motor movement. • Climbing Area—large logs are piled for climbing. This also serves as a place to read stories and talk together. • Music and Movement Area—xylophones and washers adorn a music wall. Dancing scarves and musical instruments are brought out to explore sound and movement concepts. 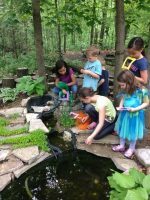 • Water Area—children love watching the fish, tadpoles, frogs, and water insects in the pond. • Wildflower Weaving Area—native plants adorn this open space with a weaving loom nearby. • Gathering Area—low logs for sitting around a fire ring for storytelling and talking about nature. 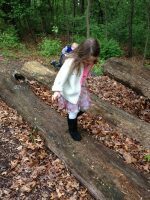 • Woodlawn Woods—about ten acres of woods with trails are adjacent to the outdoor classroom for guided hikes, scavenger hunts, and nature play. Additional future plans include a sunflower hut, dedicated vegetable garden, fairy garden, and fort building area. 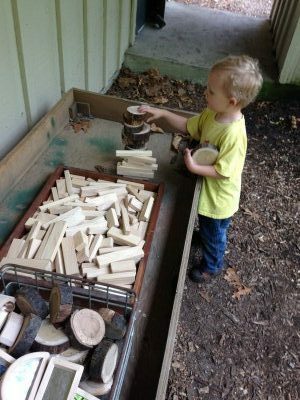 Many items are stored inside the Center in the Loose Parts Play area and brought out for specific nature play sessions and can be checked out by visitors to the Nature Center. Celebrating its 50th year in 2015, Woodlawn Nature Center’s mission to connect others to nature is enhanced by the outdoor classroom. Play and quality nature education is part of the organization’s strategic plan. 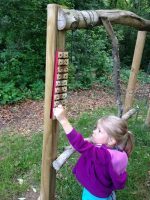 Children and families actively use the space for learning about and exploring nature. Natural materials are used throughout the playscape, often using stumps and branches from fallen trees in the nearby woods. The outdoor classroom is set behind the Nature Center, with many native trees as part of the landscape, such as mulberry, catalpa, oak, and honey locust. A wildflower area includes tall grasses, spiderwort, milkweed, and more. Other plantings include cultivated flowers such as tulips and irises. The front of the center has shade tolerant wildflowers. Spring ephemerals line the nearby woods. The woods are primarily oak, yet also contain tulip poplars, maple, river birch, cherry, and more. The trails are often used for guided explorations, scavenger hunts, and nature play. The City of Elkhart helped provide mulch for the area, as well as the use of the land through a lease agreement. The National Association for Interpretation Region 4 helped with grant funding, allowing the purchase of a natural loom, dancing scarves, a clear easel, outdoor fabric, buckets, shovels, mirrored blocks, and more. Several groups, like 4-H, Scouts, and families, helped create parts of the Outdoor Classroom. The site is successful due to the dedicated volunteers who continue to carry out a vision of children connecting with nature.